When selling a house, we understand the importance of first impressions. We are committed to presenting every house to their fullest potential to the widest possible audience. We produce high quality marketing literature for all our properties promoting your house’s key attributes, giving comprehensive and accurate representation and detailed floor plans. All our images are taken by professionally trained photographers. All our properties are listed on the top property website portals including rightmove.co.uk and zoopla.co.uk, as well as in the traditional property sections of the local papers and sent out via email to our extensive database of prospective buyers. We constantly monitor feedback to make sure that your property reaches the right buyers. Our striking illuminated shop window viewable from the mainline train station platform is one of the many factors that puts us ahead of the other Estate Agents in Tunbridge Wells. 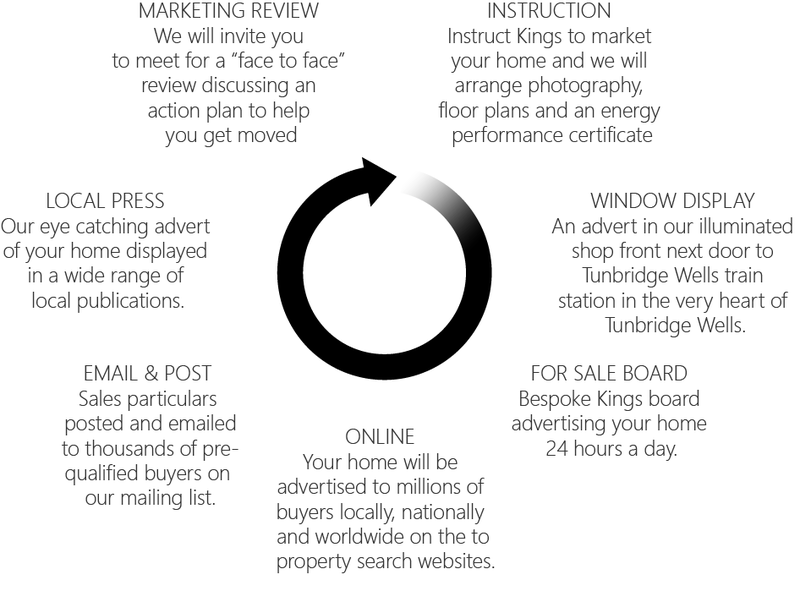 Our marketing cycle will make sure your home reaches the widest possible audience. Why not contact us now to arrange a valuation?